Sunday, September 8, 2019, 4 p.m. - 7:30 p.m.
For one afternoon only, Montalvo's historic Villa and gorgeous gardens will be transformed into a gourmet paradise. Sample savory and sweet fare from some of the most celebrated restaurants in the Bay Area and enjoy tastings from many of the region’s finest wineries. Bid on exciting live and silent auction items featuring luxurious wine lots and utterly unique experience packages. Proceeds will go to support Montalvo and its arts and education outreach programs. 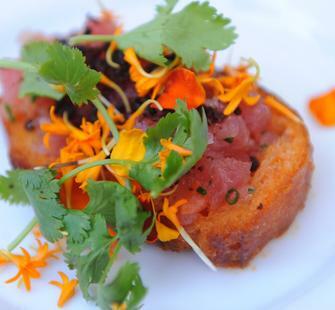 The best way to experience Food & Wine is as a VIP guest. Enjoy valet service straight to the front door of the Villa; expedited check-in; and access to a special VIP seating area, and exclusive tastings. Questions? Contact Emily Lieu-Harris at 408-961-5847 or elieu@montalvoarts.org.